Charles Vander Kooi, speaking at Hardscape North America in 2015, was a regular presenter at state and national events. Construction and landscape industry consultant Charles Vander Kooi died earlier this month of a heart attack while on a business trip. He was 68. (Update 4/12/16): A memorial service for Vander Kooi will be held at 1 p.m., April 25, at the Evergreen Memorial, 266 North Turkey Creek Rd., Evergreen, Colo., 80439, according to the HardScape Magazine Facebook page. Vander Kooi, a former construction estimator and executive, was principal of Vander Kooi & Associates, based in Littleton, Colo. He is known for being a speaker, author and founder of HardScape magazine. He’s survived by his wife, Hazel, and two daughters. Services and memorial details are not yet available. Over several decades of consulting, Vander Kooi presented more than 2,000 seminars to construction and landscape professionals and worked with more than 1,500 companies to improve their estimating/bidding systems, according to his website. 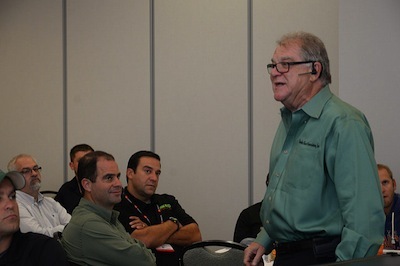 He was a regular presenter at state association meetings and national events, such as Hardscape North America. One of his hallmarks was teaching the multiple overhead recovery system for budgeting. His former colleague and one-time client Jerry Gaeta called him a forerunner of consultants in the landscape and construction industries. Mark Borst, president of Borst Landscape & Design in Allendale, N.J., was a client of Vander Kooi’s and has been a part-time associate at Vander Kooi & Associates for a decade. Industry members also knew Vander Kooi for his energetic and passionate speaking style, Gaeta said.